In this book, we have summarized recent progresses due to novel nanomaterials for sustainable water resources. 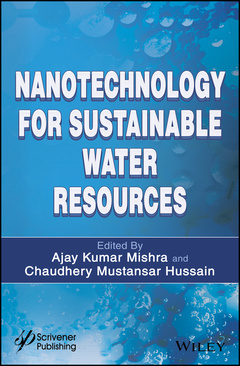 Book provides a summary of the state of the art knowledge to scientists, engineers and policy makers, about recent developments due to nanotechnology for sustainable water resources arena. The advances in sustainable water resources technologies in the context of modern society’s interests will be considered preferably which allow to identify grand challenges and directions for future research. The book contributors have been selected from all over the world and the essential functions of the nanotechnologies have presented rather than their anticipated applications. Moreover, up to date knowledge on economy, toxicity and regulation related to nanotechnology are presented in detail. In the end, role of nanotechnology for green and sustainable future has also been briefly debated. Ajay Kumar Mishra is a full Professor at the Nanotechnology and Water Sustainability Research Unit at College of Science, Engineering & Technology, University of South Africa. He received his MPhil and PhD degrees in 2003 and 2007 respectively from The University of Delhi, India. He is also working as an Adjunct Professor at Jiangsu University, China. His research interests include synthesis of multifunctional nanomaterials, nanocomposites, biopolymers, smart materials, CNT and graphene-based composite materials and water research. He has authored more than 100 scientific journal articles and edited several books. C.M. Hussain is an Adjunct Professor, Academic Advisor and Lab Director at the New Jersey Institute of Technology (NJIT), Newark, USA.